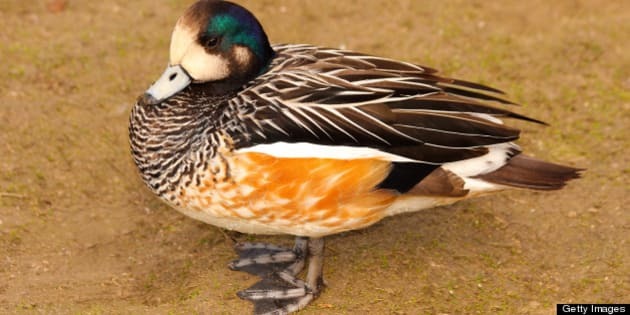 The Falcated Duck or Falcated Teal (Anas falcata) is a Gadwall-sized dabbling duck, breeds in eastern Asia. A spokesman for potash producer Mosaic says about 50 ducks were rescued after landing on waste water ponds at its Belle Plaine mine in southern Saskatchewan. Brad DeLorey says several ducks died, even though officials tried to save them. DeLorey blames unseasonal spring weather for what he calls an unusual circumstance. The harsh winter means water spots for returning waterfowl are still frozen, so the birds have been landing on the pools. DeLorey says the ponds are set up to deter birds and further preventative measures have been taken. He says no birds have landed on the oily, briny water since Sunday. Birds were first rescued last Tuesday and around 34 have died, said veterinarian Melanie Blager. "They dunk and cover themselves with oil," says Blager, which leaves them unable to fly. "They're kind of stuck on the ground there until they're rescued," she adds. Additional preventive measures including constant patrol of the site were taken, says Blager.